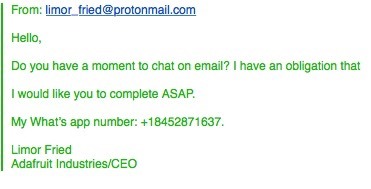 ALERT: Someone is sending emails as a fake Limor Fried & using Whatsapp … @whatsapp « Adafruit Industries – Makers, hackers, artists, designers and engineers! So! Here’s a screenshot of the email that is being used each time. 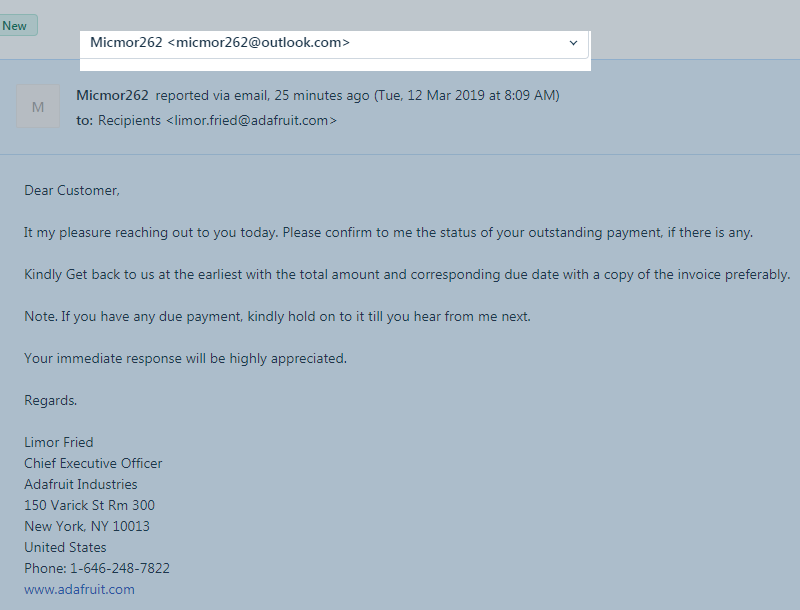 The electronic companies are all smart and knew right away it was not the real Limor, enough were sent out though that we wanted to post about it here to refer to. To be clear, that is not Limor. Limor does not even have a phone (or send emails like that). 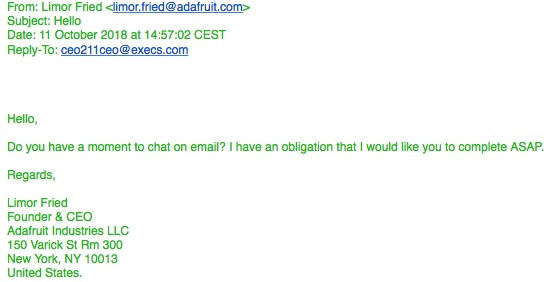 The Adafruit team uses only the following means for official Adafruit business: @adafruit.com and we do not use Whatsapp for phone calls. 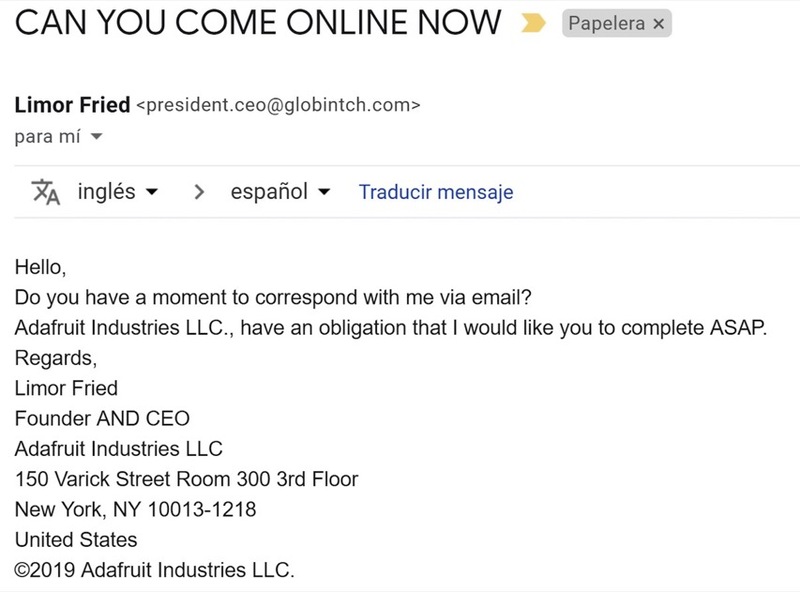 In the past (and present, and future..) harassers, scammers, and stalkers have made fake Adafruit sites, sent emails as fake-Limor, fake-pt, fakes to our CFO, etc… pretty much everything that happens when you have a company or are a person online it seems. Shields up, stay frosty, and please email [email protected] when in doubt, we’ll check it out. “We will take appropriate action against the account. If you notice any other similar accounts in the future, please let us know. Another wave of fake Limors today. We contacted the hosting provider(s) and more as usual. Update: 3/11/2019, they are still at it… they are now using: 69.168.97.48 IP, smtp.hughes.net, from: [email protected] (we’ll see if there is a way to report this). Update: 3/12/19, Microsoft banned the account.